Louis Hourlier was architect of the City of Cannes from 1878 to 1890. From 1895 to 1904 he was a member of the Town Council. he was among the first architects in Cannes to use iron an metallic structures in his buildings. Among his works are the kiosk of Les Allées (1880), Casino des Fleurs and the Hotel Gallia (1888). He also built many villas in Cannes. One of them is the Villa Les Mimosas (1878). 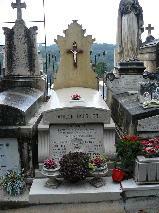 The grave of Louis Hourlier at the Cimetière du Grand-Jas, Cannes.